A BIG thank you to everyone who entered the Spa For Ma giveaway! We ended up with over 1950 entries! Wow! We had such fabulous sponsors so thank you to all for making the event so successful! The winner of the Pampering Prize Package worth over $150 is Veronica L.! Congratulations! I wanted to let you know that I have several BIG giveaway events (similar to Spa For Ma) coming soon! I am still looking for sponsors. Sponsors - please contact me for more information! The rest of you make sure you come back to enter! 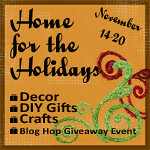 While you are waiting for all of these BIG events - be sure to enter my current giveaways! I currently have 8 happening right now! All of my giveaways are EASY TO ENTER using Rafflecopter!